Select your location from below to view the available product, pricing and delivery options for your region. We regret to announce that Razer Game Store (gamestore.razer.com) has ceased operations on February 28, 2019 at 0100hrs Pacific Time as part of the company’s realignment plans. It has been a privilege for us to recommend and deliver great digital game deals to you. We have been extremely fortunate to have you as part of our awesome community. Thank you for the support and making all this possible. We will be investing in other ways to deliver great content and introduce game promotions through Razer Gold, our virtual credits system. Do visit us there and stay tuned for more news. For additional information on how this change affects you, please check out our FAQ. When is Razer Game Store closing? The Razer Game Store will be closing on February 28, 2019 (Thursday) at 0100hrs Pacific Time. What happens to the games I have purchased? All purchased games will still work even after the closure. In case you haven't activated your Steam or Uplay keys yet, make sure to retrieve them before February 28 from the Razer Game Store. Your game keys have been sent to your email upon purchase, so you'll still be able to retrieve them in the future. What happens to the games I have pre-ordered? Razer Game Store will still fulfil and send your pre-ordered games. How do I get help for my purchases on Razer Game Store after the closure? In case you need assistance after 28th February 2019, please don’t hesitate to contact our Customer Support team. Information on purchases will not be available after 27th August 2019. I topped up my Razer Gold to buy games on the Razer Game Store. What can I do with them? There are plenty of ways to unlock great content with your Razer Gold. Check the Razer Gold Game Catalog to get games online. Can I still get games from Razer? Razer will continue bringing games to gamers via other services. You can use Razer Gold to buy games online or redeem games with your Razer Silver earnings . What happens to my Silver rewards? All Razer Silver earned from Razer Game Store purchases will still be valid. You can check how much Razer Silver you have and use it to redeem various rewards even after the Razer Game Store closure. Will my Razer Game Store discount vouchers continue to work? Please use your discount vouchers before February 28 as these will be considered null and void after the closure. Will my Razer Store discount vouchers (received through Razer Exclusives) still work? Razer Store vouchers will still be valid until the expiry date. Please use them in Razer Store before they expire. Will my Razer ID account still work? You would still be able to use your Razer ID and use it to sign in to other Razer and partner sites. Will I continue to receive updates from Razer ? You will not receive any further marketing emails from the Razer Game Store. However, you will continue to receive marketing messages from other Razer teams if you have opted to receive messages from them. You can check which marketing emails you are subscribed to at the Razer ID website. Note: Razer will still send you emails necessary for the operation of your account. This includes receipts for your purchases, security information or feature-related emails that you have explicitly requested for. What happens to my data? I’m a Lenovo user and I received a 50 USD voucher for the Razer Games Store set to expire on March 31, 2019. Is this still valid? Razer Game Store 50 USD vouchers, delivered by Lenovo, have been converted to Razer PIN codes of equivalent value which you can exchange for Razer Gold to purchase digital games and/or in-game. 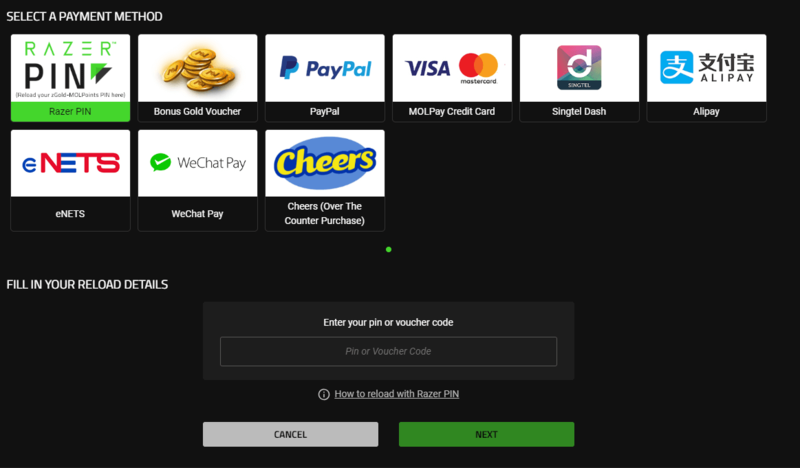 To convert your Razer Game Store vouchers and immediately load 50 USD (or the local currency equivalent) on your Razer Gold wallet, simply go to the Razer Gold reload page, select Razer PIN as your payment method, and enter the voucher code in the reload details. Note: This action has to be performed before your Razer Game Store voucher or Razer PIN expires on March 31, 2019. Please make sure to immediately use any Razer Gold obtained from this action, as these are set to expire 1 month after reload. You may use your Razer Gold and enjoy any of our ongoing promotions on digital games, or explore our catalog of offers.